Rig a lifeline with a gate in minutes using the stainless steel Quick Attach™ Pelican Hook. It features a mechanical swage fitting which allows for fast installation using simple hand tools. 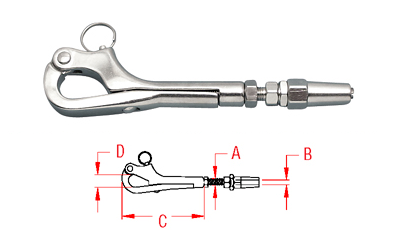 This swageless pelican hook can be used with any type of cable construction (1×19, 7×19 or 7×7). All Threads are Right Hand “UNF”. We do not carry Left Hand Pelican Hooks.